For years, Something Awful forum members have reveled in user bEatmstrJ's blow-by-blow account of a terrible bathroom remodel, in which he sought to transform his bathroom "with a woman in mind" with an eye to a future home-sale ("woman play an unfair role in the home-buying process"); bEatmstrJ's saga combines terrible ideas about how a bathroom should look with total home-renovation incompetence, making it the perfect foil for Something Awful's pioneering brand of jeering insults and mayhem. 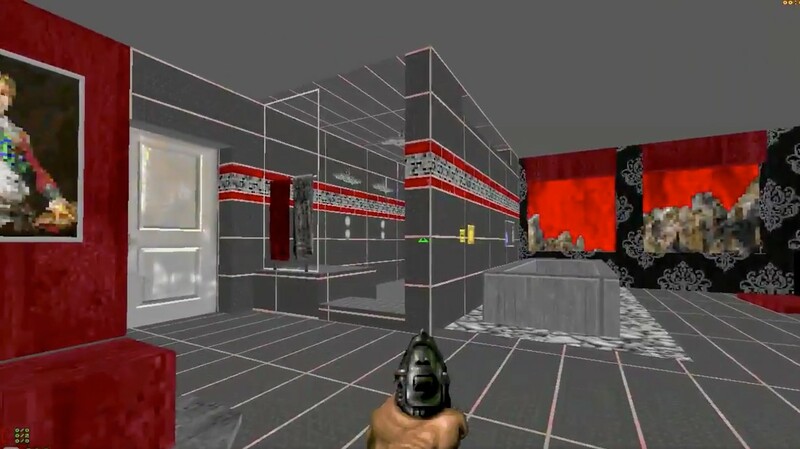 Now, Something Awful user Dieting Hippo has celebrated bEatmstrJ's bathroom by immortalizing it as a level for the venerable first-person-shooter Doom II, and so was born BATHDOOM. Dieting Hippo told Matthew Gault from Motherboard that bEatmstrJ had transformed his bathroom into "a bathroom that would appeal to cans of Axe body spray." BATHDOOM is the product of bEatmstrJ’s hubris and Dieting Hippo’s genius. Everything is there—the weird color scheme, the psychedelic paintings, and the rocks that hurt your feet (and cause the player to take damage). It’s not the first time that bEatmstrJ’s cursed bathroom has been injected into a video game. After he posted pictures of the finished bathroom and was roundly mocked, one poster recreated the bathroom in The Sims 4 and declared it too garish for use even by digital humans.